A performance will be held following the screening of the film and it will include the musicians who appeared in the documentary such as Milly Quezada, Wilfrido Vargas, Fernando Echavarrìa, Fefita la Grande and Luis Segura, who represent the Dominican musical genre featured in the documentary. Santo Domingo, November 21, 2009 - The III Dominican Republic Global Film Festival will come to an end on Sunday the 22nd with a screening of the documentary Sol Caribe. Following the film, at the National Theater, there will be a spectacular musical performance put on by the popular musicians who appeared in the film. 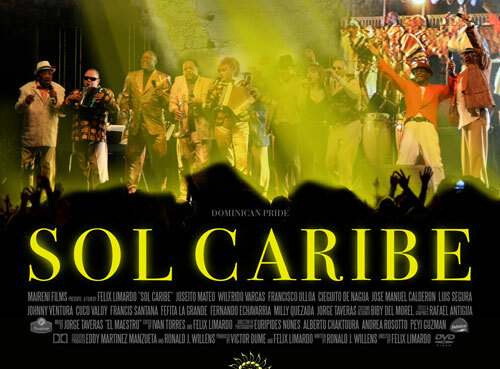 The documentary aims to show the world the roots, development and current status of popular Dominican music as seen through the eyes of 12 musicians representing the various genres such as popular and typical merengue, bachata and “son” with such musicians as Milly Quezada, Wilfrido Vargas, Joseíto Mateo, Fefita La Grande, Johnny Ventura, el Cieguito de Nagua and Francisco Ulloa. Well-known bachata performers, or bachateros, José Manuel Calderón, pioneer of the genre and Luis Segura as well as Son musicians Fernando Echavarría, Francis Santana and Cuco Valoy will be on hand. An orchestra of 17 musicians under the direction of Jorge Taveras, will accompany the singers in their interpretation of the song, “Puerta del Nuevo Mundo,” written by Huchi Lora, and which brings together all four of the above-mentioned rhythms. The documentary is based on an unprecedented series of concert tours made by these pioneers of Dominican music. The story in this documentary, told through images and sounds, will introduce the public around the world to this influential music that developed in the cradle of America. The movie was directed by Félix Limardo and produced by Vìctor Dumé; Eddy Martínez and Ron Willens are executive producers. Editing was done by Iván Torres and Félix Limardo. Mairení Films produced the film. In this 70-minute film, Sol Caribe shows the evolution of the different styles and rhythms that originated in the Dominican Republic as seen through the eyes of those who promoted them. Through personal stories and sounds of the best Dominican music, the film explores how the music was conceived and how these popular genres were exported to all corners of the earth. “Through a series of performances, especially of orchestras and improvised musical sessions that occurred in historic places, we will witness the musical inheritance that has never before been documented to this extend and in all its aspects,” said the film’s producers. The III Dominican Global Film Festival presented 30 films from around the world simultaneously in Santo Domingo, Santiago, Puerto Plata, Nagua and Cap Cana. The Festival also included a tribute to special guest of honor, Egyptian actor Omar Sharif. The event opened with the world premiere of the film Touched and a magnificent ceremony held in the National Theater and attended by President Leonel Fernàndez, First Lady Margarita Cedeño de Fernàndez, actors Omar Sharif, Michael Madsen, the cast and crew of Touched, headed by Shalim Ortiz, among other invited guests. The III Dominican Global Film Festival was made possible with the generous support of CapCana, Abastos & Services, SERIGRAF, Digital 15, Punta Perla, Radio Cadena Comercial, Ruíz Centro Stereo, Telemicro, Telemicro Internacional, La 91, Zol, Radio Disney, Odebrecht, CTN, Hotel Santo Domingo, New World Films, Ram Engineering, WindTelecom, Tech Films Solutions 3, Thrifty, Amhsa Marina, Aquí y Allá, Tiendas Corripio, Dominicana Radio Dispacher, Induban, Cinema Palace and MADE. In addition, the Festival also received from UASD, the National Theater, Cinemateca Dominicana, Mauricio Báez Club, León Center, Air Ocean, Memoria de Nación Foundation, LVT Subtitlings, RNN, Ministry of Education (SEE), Ministry of Higher Education, Science and Technology (SEESCyT), Sousa Sistemas, Telecentro and Vinópolis. The Spanish Embassy, Spanish Aid Agency (AECI), the United States Embassy through the Franklin Center and the Mexican Embassy also contributed to the success of the Festival.